The 2017 World Baseball Classic (WBC) was an international professional baseball competition, composed of 16 competing nations, held from March 6 to March 22, 2017. It was the fourth iteration of the World Baseball Classic. The first-round hosts were Seoul, Tokyo, Miami and Zapopan. 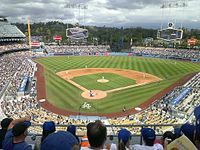 The second-round hosts were Tokyo and San Diego, and the championship round was played in Los Angeles. Twelve of the sixteen competing nations qualified based on their performance during the first round of the 2013 tournament; the remaining four nations are the winners of four qualification tournaments that took place in February, March and September 2016. Two of the four qualifiers, Colombia and Israel, each made their first appearance in the WBC, and both have secured their positions for the 2021 World Baseball Classic. The Netherlands, Japan, Puerto Rico, and the United States advanced to the championship round. Defending champion Dominican Republic was eliminated in the second round. The United States defeated Puerto Rico to win the championship game, 8–0. Marcus Stroman was named tournament MVP. He made three starts for the U.S. and posted a 2.35 ERA in 15​1⁄3 total innings, including six shutout innings in the championship game. The top three teams from each pool of the first round of the 2013 World Baseball Classic automatically qualified. The first and second rounds of the tournament were played in round-robin format, with each team playing each other team in their pool once, as was the case in 2006. However, in an effort to reduce the likelihood that a team would be eliminated on statistical tiebreakers, the tournament schedule allowed for a seventh game at each pool-play site. If there is a two-way tie for first, since both teams advance, there would be no extra game. The team that won the original game between the teams would be declared the pool winner, and the other team the pool runner-up. If there is a three-way tie for first (all three teams being 2–1, and the last team 0–3), head-to-head results would not help to break the tie. In this case, statistics would determine the first-place team, and the other two would play to determine the pool runner-up. If there is a three-way tie for second (all three teams being 1–2, and the first team 3–0), statistics would determine the top two teams who would then play to determine the pool runner-up. The team ranked worst on the calculation would be eliminated. NOTE: Tiebreaker notes: HTH − Head-to-head. RA − Runs against. IPD − Innings the team pitched. RA/IPD − The index of RA/IPD. TG − Tiebreaker game. Pool A of the First Round of the 2017 World Baseball Classic was held at Gocheok Sky Dome, Seoul, South Korea from March 6 to 10, 2017, between Team Israel, the Netherlands, South Korea, and Taiwan. Pool A was a round-robin tournament. Prior to the start of the tournament, ESPN considered Team Israel, ranked 41st in the world, to be the biggest underdog in the tournament, referring to them as the "Jamaican bobsled team of the WBC". Team Israel (3–0) and Team Netherlands (2–1) qualified for the second round, in Japan. Israel became the first baseball team to go undefeated in the first round of the WBC’s main draw after entering the main draw by winning in a qualifying round. In what NBC reported was thought to be the tallest batter-pitcher matchup in baseball history, the Dutch team’s 7-foot-1-inch (2.16 m) Loek van Mil walked Israel's 6-foot-8-inch (2.03 m) Nate Freiman. Israel's catcher, Ryan Lavarnway, was named Pool A MVP, after going 5-for-9 (.556/.692/.889), with four walks, a home run, and three RBIs. Two-time champion Japan concluded Pool B with a 3–0 record, whereas China lost all three games and must now qualify for the 2021 World Baseball Classic. Cuba defeated Australia to advance to the second round. In the first round, after batting .364 Japanese outfielder Yoshitomo Tsutsugoh was named the Pool B MVP. After falling behind 5–0 in the sixth inning, Dominican Republic rallied to defeat the U.S. 7–5 in their second game. On the last day of the pool, Colombia tied their game against Dominican Republic 3–3 in the eighth on a Jorge Alfaro home run, and had a chance to win in the ninth inning, but Oscar Mercado was called out at home trying to score on a sacrifice fly. The game continued into extra innings, where Dominican Republic scored 7 runs in the 11th to win and finish the pool undefeated. The U.S. then took an early lead on Canada, winning 8–0 to claim the second berth in San Diego. While debutants Colombia secured their position for the upcoming 2021 World Baseball Classic, Canada's fourth-place performance meant that they will now have go to the qualifiers in order to try and make their fifth appearance in the WBC, in 2021. Manny Machado of the Dominican Republic was named MVP for the first-round Pool C bracket of the WBC, after batting .357. The first tiebreaker criterion is fewest runs allowed per defensive inning played (RA/IPD) in the games between the tied teams. Mexico allowed 19 runs, Italy allowed 20 runs, and Venezuela allowed 21 runs. Italy and Venezuela played 19 innings each in the two games, therefore their RA/IPD were 1.053 and 1.105. Mexico played 18 innings, but they recorded no outs in the ninth inning of their game versus Italy, therefore the inning did not count towards their RA/IPD of 1.117; however, the five runs scored in the same half-inning by Italy counted against Mexico's RA/IPD. Undefeated Japan (3–0) and the Netherlands (2–1) advanced to the semi-final round, as Israel (1–2) came in third, and Cuba (0–3) fourth. Pool F started with Puerto Rico handing the Dominican Republic its first loss since the 2009 World Baseball Classic. Puerto Rico ended Pool F still undefeated and Venezuela was eliminated, going 0–3. The final game of the pool was a rematch between the United States and Dominican Republic to advance to the championship round. The DR took an early 2–0 lead in the first inning, but the United States came back to win 6–3 to eliminate the defending champions. Organizer WBCI[who?] had no interest in the final standings so did not compute them. Instead, they were calculated by WBSC for inclusion in the WBSC Men's Baseball World Rankings system. Tele Rebelde, Digital Channels: HD 1 y HD 2. ^ "2017 World Baseball Classic schedule released". ^ Morosi, Jon Paul (September 17, 2015). "Source: Brooklyn among four WBC qualifying sites to be named". Fox Sports. Retrieved September 18, 2015. ^ "Rules – World Baseball Classic". Retrieved March 7, 2017. ^ "Wayback Machine" (PDF). March 7, 2017. Archived from the original (PDF) on March 7, 2017. Retrieved March 18, 2018. ^ "Team Israel – and its mascot, Mensch on a Bench – is the Jamaican bobsled team of the WBC", ESPN. ^ "World Baseball Classic: Israel's Cinderella Run Forges Ahead After Upsetting Taiwan", Haaretz. ^ "Israel Goes to 3–0 at World Baseball Classic", The New York Times, March 9, 2017. ^ ., The New York Times. ^ Calcaterra, Craig (March 9, 2017). "Video: 7'1″ vs. 6'8″ — the tallest pitcher-batter matchup ever". ^ "Israel's Lavarnway named MVP of Pool A", mlb.com. ^ "World Baseball Classic: Cuba, Japan advance to 2nd round". ^ "Yoshitomo Tsutsugoh is MVP of WBC '17 Pool B". Retrieved March 14, 2017. ^ "United States puts away Canada early, advances to second round of WBC". Retrieved March 14, 2017. ^ "Japan beats Israel 8-3 to advance to World Baseball Classic semifinals". japantoday.com. Retrieved March 18, 2018. ^ "New WBSC World Rankings revealed following World Baseball Classic 2017". WBSC. Retrieved April 2, 2017. ^ "World Baseball Classic: Previous champs, results, medal count, MVPs, All-WBC teams". cbssports.com. Retrieved March 18, 2018. ^ a b "International Broadcast Partners". World Baseball Classic. Retrieved March 7, 2017. ^ "CDN Sports-Max presenta su oferta para el 2017" (in Spanish). listindiario.com. January 20, 2017. ^ Gonzalez, Juan Fernandez. "DirecTV wins World Baseball Classic rights for LATAM". Retrieved March 14, 2017. ^ "Wapa 2 transmitirá el Clásico Mundial de Béisbol en Puerto Rico" (in Spanish). PrimeraHora.com. November 30, 2016. ^ "едем в Лос-Анджелес на первый полуфинал Мировой Бейсбольной Классики!" (in Russian). Viasat-sport.livejournal.com. March 20, 2017.